Ethereum received an incredible response at the Miami Bitcoin Conference. We traveled there anticipating many technical questions as well as a philosophical discussion about the purpose of Ethereum; however, the overwhelming amount of interest and enthusiasm for the project was much larger than we had anticipated. 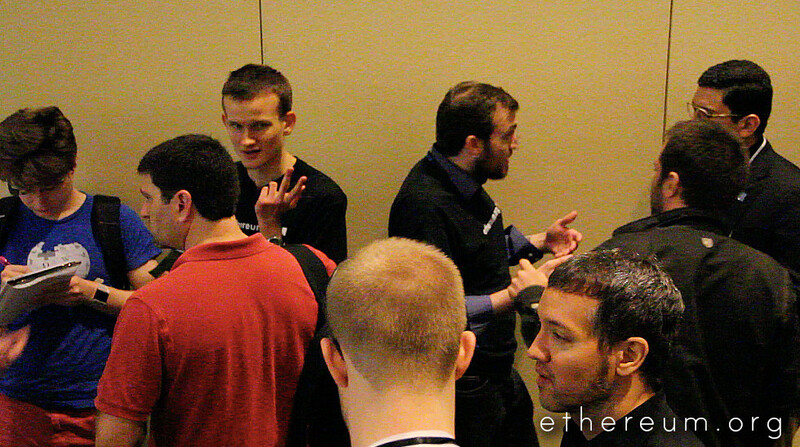 Vitalik’s presentation was met with both a standing ovation and a question queue that took hours to address. The Ethereum project is also excited to announce the alpha release of the open source testnet client to the community at the beginning of February. This will give people an opportunity to get involved with the project and experiment with Ethereum scripts and contracts, and gain a better understanding of the technical properties of the Ethereum platform. Launching the testnet at this date will give those interested in the fundraiser a chance to better understand what the Ethereum project is about before participating. I first wrote the initial draft of the Ethereum whitepaper on a cold day in San Francisco in November, as a culmination of months of thought and often frustrating work into an area that we have come to call “cryptocurrency 2.0” – in short, using the Bitcoin blockchain for more than just money. In the months leading up to the development of Ethereum, I had the privilege to work closely with several projects attempting to implement colored coins, smart property, and various types of decentralized exchange. At the time, I was excited by the sheer potential that these technologies could bring, as I was acutely aware that many of the major problems still plaguing the Bitcoin ecosystem, including fraudulent services, unreliable exchanges, and an often surprising lack of security, were not caused by Bitcoin’s unique property of decentralization; rather, these issues are a result of the fact that there was still great centralization left, in places where it could potentially quite easily be removed. What I soon realized, however, was the sheer difficulty that many of these projects were facing, and the often ugly technological hacks that were required to make them work. And, once one looks at the problem carefully, the culprit becomes obvious: fragmentation. Each individual project was attempting to implement its own blockchain or meta-layer on top of Bitcoin, and considerable effort was being duplicated and interoperability lost as a result. Eventually, I realized that the key to solving the problem once and for all was a simple insight that the field of computer science first conceived in 1935: there is no need to construct a separate infrastructure for each individual feature and implementation; rather, it is possible to create a Turing-complete programming language, and allow everyone to use that language to implement any feature that can be mathematically defined. This is how our computers work, and this is how our web browsers work; and, with Ethereum, this is how our cryptocurrencies can work. Since that moment, Ethereum has come very far over the past two months. The Ethereum team has expanded to include such distinguished members as Charles Hoskinson, head of the Bitcoin Education Project, Anthony Di Iorio, Executive Director of the Bitcoin Alliance of Canada and founder of the Bitcoin Decentral coworkingspace in Toronto, and Mihai Alisie, founder and chief editor of Bitcoin Magazine, and dozens of other incredibly talented individuals who are unfortunately too many to mention. Many of them have even come to understand the project so deeply as to be better at explaining Ethereum than myself. There are now over fifteen people in our developer chat rooms actively working on the C++ and Go implementations, which are already surprisingly close to having all the functionality needed to run in a testnet. Aside from development effort, there are dozens of people operating around the world in our marketing and community outreach team, developing the non-technical infrastructure needed to make the Ethereum ecosystem the solid and robust community that it deserves to be. And now, at this stage, we have made a collective decision that we are ready to take our organization much more public than we have been before. The purpose of this post is not to say that Ethereum will be using Slasher in place of Dagger as its main mining function. Rather, Slasher is a useful construct to have in our war chest in case proof of stake mining becomes substantially more popular or a compelling reason is provided to switch. Slasher may also benefit other cryptocurrencies that wish to exist independently of Ethereum. Special thanks to tacotime for some inspiration, and for Jack Walker for improvement suggestions. Proof of stake mining has for a long time been a large area of interest to the cryptocurrency community. The first proof-of-stake based coin, PPCoin, was releasd by Sunny King in 2012, and has consistently remained among the top five alternative currencies by monetary base since then. And for good reason; proof of stake has a number of advantages over proof of work as a mining method. First of all, proof of stake is much more environmentally friendly; while proof of work requires miners to effectively burn computational power on useless calculations to secure the network, proof of stake effectively simulates the burning, so no real-world energy or resources are ever actually wasted. Second, there are centralization concerns. With proof of work, mining has been essentially dominated by specialized hardware (“application-specific integrated circuits” / ASICs), and there is a large risk that a single large player such as Intel or a major bank will take over and de-facto monopolize the market. Memory-hard mining algorithms like Scrypt and now Dagger mitigate this to a large extent, but even still not perfectly. Once again, proof of stake, if it can be made to work, is essentially a perfect solution. However, proof of stake, as implemented in nearly every currency so far, has one fundamental flaw: as one prominent Bitcoin developer put it, “there’s nothing at stake”. The meaning of the statement becomes clear when we attempt to analyze what exactly is going on in the event of an attempted 51% attack, the situation that any kind of proof-of-work like mechanism is intended to prevent. In a 51% attack, an attacker A sends a transaction from A to B, waits for the transaction to be confirmed in block K1 (with parent K), collects a product from B, and then immediately creates another block K2 on top of K – with a transaction sending the same bitcoins but this time from A to A. At that point, there are two blockchains, one from block K1 and another from block K2. If B can add blocks on top of K2 faster than the entire legitimate network can create blocks on top of K1, the K2 blockchain will win – and it will be as if the payment from A to B had never happened. The point of proof of work is to make it take a certain amount of computational power to create a block, so that in order for K2 to outrace K1 B would have to have more computational power than the entire legitimate network combined. In the case of proof of stake, it doesn’t take computational power to create a work – instead, it takes money. In PPCoin, every “coin” has a chance per second of becoming the lucky coin that has the right to create a new valid block, so the more coins you have the faster you can create new blocks in the long run. Thus, a successful 51% attack, in theory, requires not having more computing power than the legitimate network, but more money than the legitimate network. But here we see the difference between proof of work and proof of stake: in proof of work, a miner can only mine on one fork at a time, so the legitimate network will support the legitimate blockchain and not an attacker’s blockchain. In proof of stake, however, as soon as a fork happens miners will have money in both forks at the same time, and so miners will be able to mine on both forks. In fact, if there is even the slightest chance that the attack will succeed, miners have the incentive to mine on both. If a miner has a large number of coins, the miner will want to oppose attacks to preserve the value of their own coins; in an ecosystem with small miners, however, network security potentially falls apart in a classic public goods problem as no single miner has substantial impact on the result and so every miner will act purely “selfishly”.